Do you have problems writing learning outcomes/objectives for your content or courses? Or more specifically, do you have trouble finding the right ACTION VERBS to describe what you want your students to achieve from the course, module, topic or unit? 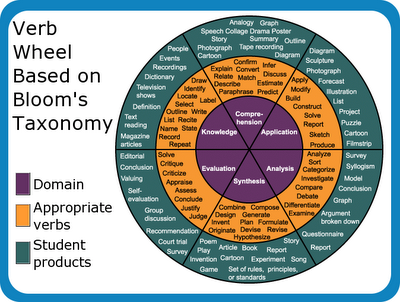 Have you tried using Bloom's Taxonomy wheel(s) before to assist finding those magic action verbs? Why not print out the one you like most (not too many, due to the shortage of trees today! 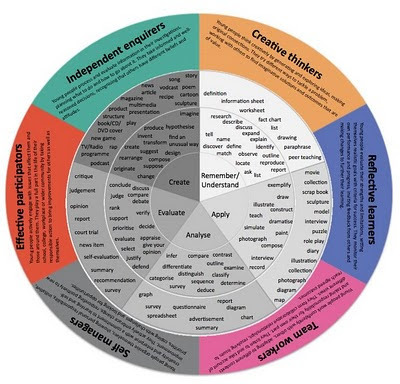 ), or download the Bloom's Taxonomy wheel images above, and then use them to find those magic action verbs that you might have struggled to find before. These wheels work much better than idiotic tables of action verbs according to Bloom's taxonomy. Trust me! "It's not about the tools, it's using the tools to facilitate learning." I still remember when I started off as an Instructional Designer in 2001, I was required to assist subject matter experts (SME) in constructing learning objectives/outcomes. Especially, in the beginning it was a nightmare, because I struggled with finding and suggesting the appropriate action verbs. But then one of the senior instructional designers introduced me to Bloom's taxonomy wheel(s), and from then on writing instructional sound learning outcomes has been as easy as eating rambutan. When developing content with SMEs it certainly helps having relevant and agreed upon learning outcomes early on to guide the content development process. In other words, it is good to spend some time on constructing them, and not just creating them as an afterthought, because of some education ministry requirements. I am not sure about your country, but in Malaysia the Bloom's taxonomy is the reference that Ministry of Higher Education (MOHE) recommend (a requirement to use! ), and most Universities use it to construct learning outcomes with an eye on infusing more deep thinking (critical and creative), or higher order thinking skills (HOTS). As an action verb classification system I am fine, but I have low regard for Bloom's taxonomy as a pyramid, whereby Evaluation (old version) is on the top. It is helpful, but to me it is misleading. But that, we can discuss in another post sometime in the future (However, your opinion about Bloom's taxonomy would be highly appreciated). Also, I would like to highlight that Clayton R. Wright has simplified the process in finding those magic action verbs. He found that many participants in his workshops found it easier to deal with a smaller number of categories than the six stated by Bloom. Some verbs can be found in several categories, but it depends on how they are used. Rather than use verbs at the lower-end of the skills spectrum, he suggests that emphasis should be placed on application and problem-solving skills. The list is not "a magic bullet", but it helps educators who have difficulty finding the word that describes what they want their students to achieve. "If we could transform these tables into a wheel, it would simply be awesome!" When creating objectives for secondary and post-secondary courses, Clayton reminds his workshop participants to also consider the 21st Century Learning Outcomes developed by the League for Innovation and sponsored by the Pew Charitable Trusts. These learning outcomes were validated by 260 colleges in Canada and the United States. They cover a variety of skills such as technology skills, communication skills, computational skills, critical thinking and problem-solving skills, information management skills, interpersonal skills, personal skills, and community skills. All of these skills are important for those living in a digital world. Although, learning outcomes usually helps in the content development process, but do they help or guide students in the learning process? Are learning outcomes really important to facilitate the learning process? Are they destructive to facilitate creativity and innovation? Are there other ways to tell our students what learning output we should expect from them? Do we need to be more creative in the way we express learning outcomes? Great to see all the Bloom wheels in one place. I really liked the color-coded one, as I always had trouble understanding and interpreting the black and white text-based ones. Do you have any ideas why these wheels always seem focused exclusively toward the knowledge / cognitive domain, without corresponding skill or attitude ones? I just use the verbs aswell, and have not really found a use for the pyramid. I think teachers usually shy away from educational complexity, but a simple guide for verbs is great, esp when they understand how these can help define what type of outcomes they are expecting, and how these verbs can direct to the type of activities they need to prepare. So, thanks Zaid, this is great. Bloom actually has three separate paradigms. We are most aware of the cognitive one. A second dealt with the affective domain - values - and stepped from receiving to responding to valuing to organizing and conceptualizing and finally characterizing by value. 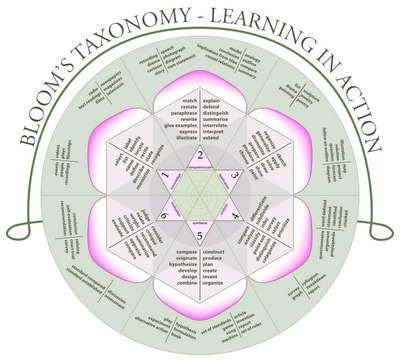 The last paradigm - psychomotor or physical skill acquisition - was never completed by Bloom. I don't think they destroy creativity if they are simply a framework for getting someone to think or a help to those that design courses. Thanks for putting them all together. Thanks for your feedback and question. Though, perhaps it could be that at the University level we in general focus most on nurturing the mind or cognitive domain, and that the attitude (affective), and skills (psychomotor) have been overlooked, or kind of ignored. Also, it could be that the domains kind of overlap in many ways, especially the action verbs and by so they have not seen the necessity to include the other domains. In addition, it could be that Bloom's other domains were not that well received or accepted as a standard to follow. Also, Bloom did not really finish the psychomotor domain (according to one comment here). Finally, it could be that the other two domains, especially the affective (attitude) domain is difficult to measure in an academic manner, and therefore has been kind of ignored. These are a few reasons I can think of for now. Just speculation! Thanks for your feedback. Just wondering, you used the words, "I don't think they destroy creativity if if they are simply a framework ...", which can be interpreted that learning outcomes can destroy creativity. So, if lecturers follow learning outcomes too strictly and ignore other learning experiences taking place, we might indirectly encourage the student to shy away from being creative and original. However, if we embed creativity into the learning outcomes, we might have better outcome. The great challenge comes when a student conceptualizes a brilliant idea to a question given, but does not answer the exam/assignment question according to what the lecturer wants. How do we mark or reward the student? She did not answer what I wanted, and therefore she gets zero, or do we perhaps reward her for the idea. Perhaps, it was not her answer that was the problem, but instead how we framed the question, which she interpreted different and then came up with a brilliant idea. The biggest challenge today is not the student, but the educator (especially those older than the Y-generation). How do we change or transform our mindset to nurture students for 21st century, which will be truly amazing from a creativity or innovation point-of-view. Can it be done? Yes, we can! we are currently doing a lot of work with regard to assessment for learning and learning objectives are a big part of our drive; however I really struggle putting them together, I teach art and feel that they are sometimes a little prescriptive and i worry that they might stifle creativity, however our training has demonstrated that they can infact promote personalised learning. I thnk the differentiator website is a real help, thank you for the link. I enjoyed reading this article. I think we do need learning outcomes. I'm a junior in college at the moment, and I think using the objectives can help: one, to remind yourself of the purpose for the class. Two, in order to sell yourself,it seems beneficial to mention those accomplished objectives during a job interview.